Sometimes you may prefer to go to a website instead of an app, even though you have the app installed. 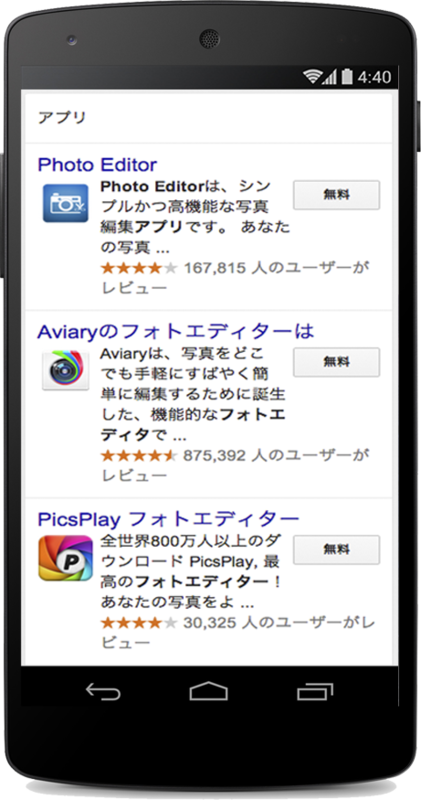 To do this, just tap on the link to the website below the result snippet. Sometimes the best answer is on a website, and sometimes it's in an app. That’s why since last December, when you search with Google on your Android device, you may see results from your apps that let you jump right to relevant content in those apps. 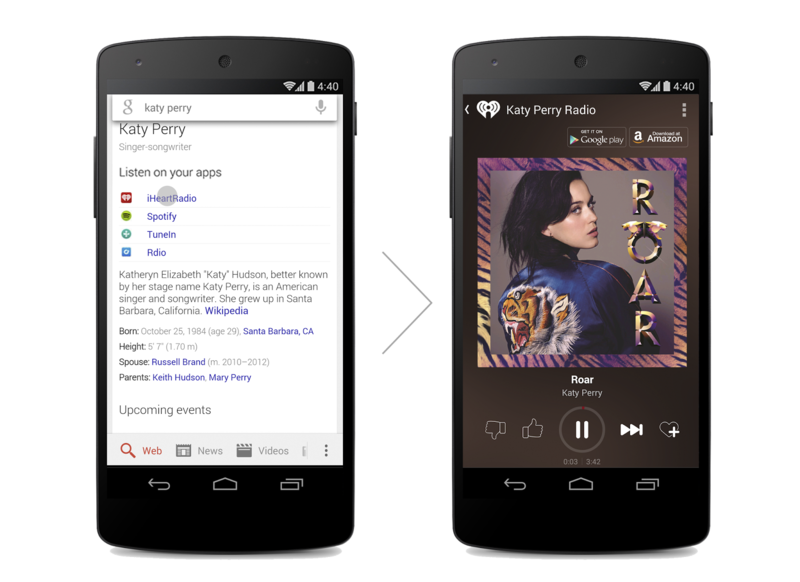 We added more apps with this capability in April and May, and this week we’ve just enabled our biggest batch yet, including apps like ABC News, Airbnb, AutoTrader, BuzzFeed, CBS, Cookpad, Crackle, Daily Mail Online, Dailymotion, The Economic Times, Fox News, francetv info, Hot Pepper Gourmet, Houzz, KASKUS, Kompas.com, musiXmatch, NDTV, Orbitz, RetailMeNot Coupons, Shazam, Strava, Subito.it, The Guardian, The Washington Post, ViewRanger GPS, Viki, and many more. 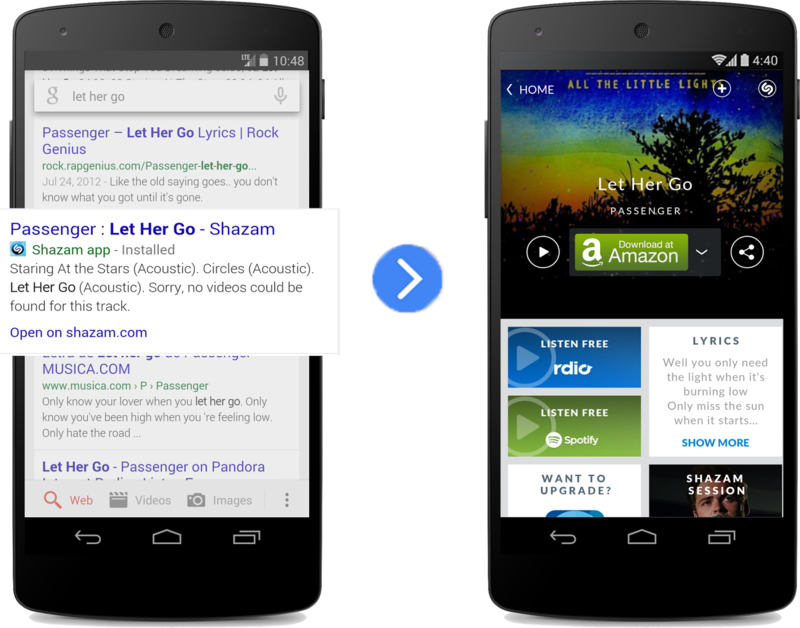 We’re also announcing today that any Android developer can now participate in app indexing, which means that even more of your favorite apps will soon become search-friendly and can organically appear in search results—just like websites. 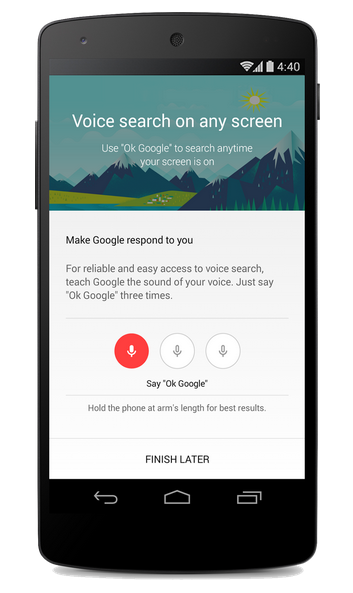 With your phone, tablet or desktop, real-time updates in Google can help you stay on top of the tournament. Simply search for [world cup] or [world cup usa] to get the team lineup, live scores, and even up to the minute information about attempted goals and player stats. Click or tap or switch between standings, schedules, specific teams, players and more. During live matches, you'll also find a timeline with all major moments so you can follow along with the action. Also new for this year’s tournament, you don't even have to search to get updates on your favorite teams—just open Google Now. You'll be given an option to start seeing cards with stats about each match that you can tap for more detail. 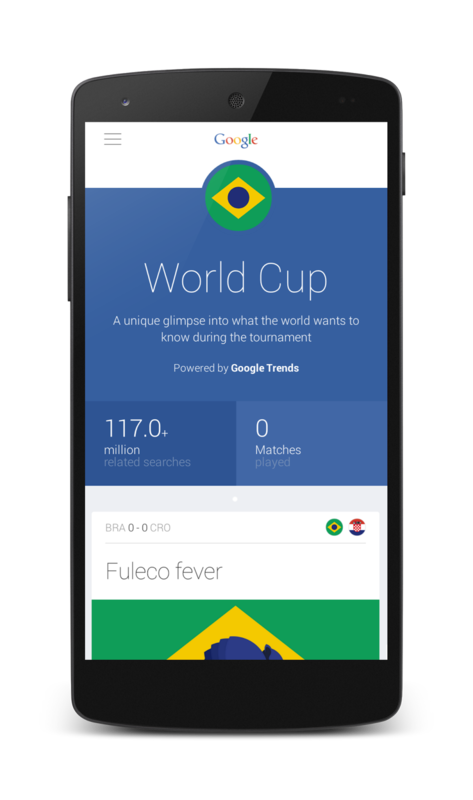 For the first time, you'll find a Google Trends experience designed specifically to help you explore the players, teams and moments that are capturing the world's attention. Check out google.com/worldcup and explore trends from all 32 competing countries. On the site, we’ll explore the areas below, and also look at surprising highlights leading up to and after each match. Sentiment: Explore how an entire country is feeling—whether optimistic or anxious—as reflected through search trends and public Google+ conversations. Top Questions: Want to know more about a penalty kick? Likely you’re not alone. Check out trending questions from every competing country before and after kickoff. Rising Players: Find out who are the players to watch and how they rank in search compared with their teammates. As you gear up to cheer on your favorite team, we’re excited to help you discover, share and connect with the moments that matter most. 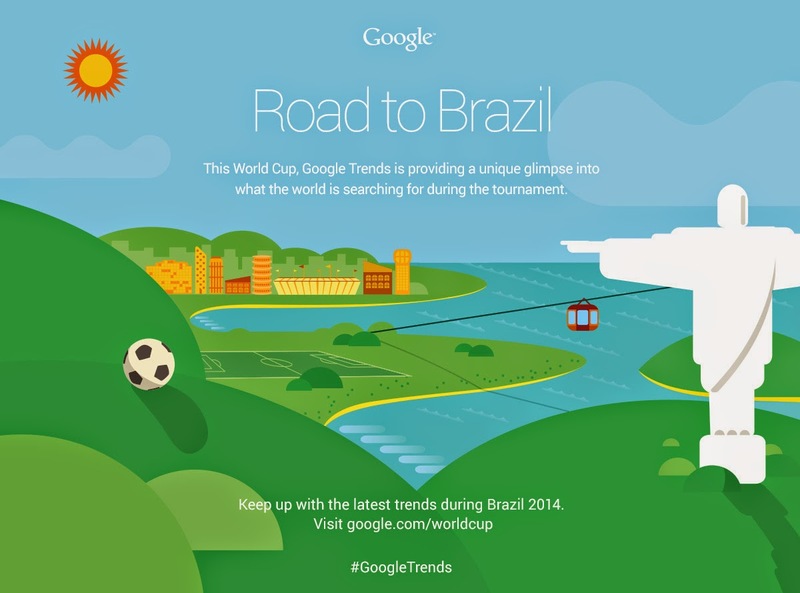 For more on the World Cup, visit our Official Google Blog. Celebrate the biggest event in sports with a little help from Google Search. For the first time, you'll find up-to-the minute live scores, team stats, and highlights. 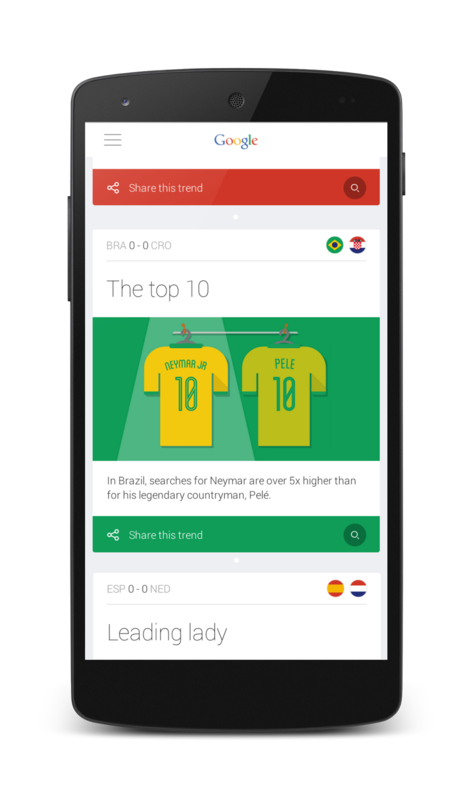 You can also explore what's trending with a new World Cup experience powered by Google Trends.